The railway at the centre of the rail disaster in Lac-Mégantic, Que., no longer has authorization to operate in Canada after the Canadian Transportation Agency pulled its certificate of fitness. The order, issued today, comes after the agency reviewed the company and found Montreal, Maine & Atlantic Railway doesn’t have enough third-party liability insurance, or the funds to pay for the self-insured portion, both of which are requirements to operate Canada. The order is effective Aug. 20, to give the company time to cease its Canadian operations. Whether the risks have been fully disclosed by the company to the insurance broker and the amounts and nature of coverage have been specified. The financial ability of the railway to sustain its self-insurance portion. The financial strength of the insurance company to pay for its coverage. That the proposed coverage isn’t out of line with that of other railways. 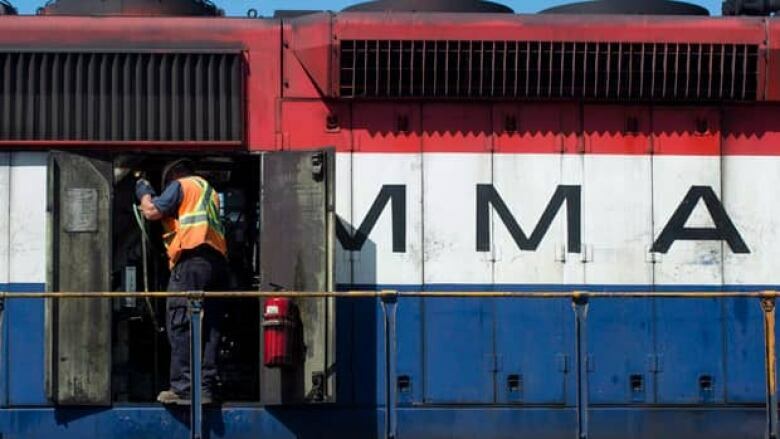 "This was not a decision made lightly, as it affects the economies of communities along the railway, employees of MMA and MMAC, as well as the shippers who depend on rail services," Geoff Hare, chair and CEO of the Canadian Transportation Agency, said in a release. Close to 70 people could lose their jobs if the company stops operating in Canada. Richard Boudreault, spokesman for the United Steelworkers union, says 13 workers have already been laid off following the derailment and still haven't been paid all the money they were owed. "What we think should be done right now is to do whatever they can to make sure that our member don't face not only the loss of their job but at least they will have the money that this company owe to them." "It would not be prudent, given the risks associated with rail operations, to permit MMA and MMAC to continue to operate without adequate insurance coverage." The agency, which acts as an independent regulator, issues certificates of fitness based on a railway's ability to secure enough third-party insurance to operate. According to the CTA, there are few players, around 30 to 40 companies, involved in rail insurance, and the industry is highly specialized. Rail companies of similar size to MM&A in North America usually have between $5 million to $50 million in coverage. The agency said no railways covered under federal regulations have exceeded the cap on third party liability policies in the past 10 years, but the huge losses in Lac-Mégantic have raised questions around how able those policies are to fully cover the impact of a catastrophic event. On July 6, an unmanned train operated by MM&A rolled down a hill, derailed and exploded in the centre of the town in Quebec's Eastern Townships. A total of 47 people were killed in the blasts and the centre of the town was levelled. Recovery and cleanup operations have been underway since. Several investigations, including one by the Transportation Safety Board and another by Quebec provincial police, are still ongoing. Last week, faced with mounting lawsuits threatened and filed in Canada and the U.S., as well as a mounting cleanup bill, MM&A applied for and received bankruptcy protection from its creditors. In light of that court decision, the government and the municipality handed over responsibility for the environmental cleanup of the devastated downtown core to a construction management company, Pomerleau Ltd.
MM&A had been supervising that work up until last week. MM&A chair Ed Burkhardt could not be reached for comment. A member of Burkhardt’s staff said this morning that he wasn’t taking calls and was unaware of the development with the railway's certificate of fitness. In light of the Lac-Mégantic disaster and the financial state MM&A found itself in in its wake, the Canadian Transportation Agency is launching a consultation and review of insurance coverage requirements for all railways operating under federal regulations.